NI-CO is currently working in partnership with Siren Associates to help mitigate the deteriorating dynamics between Jordanians and Syrian refugees and manage violent flashpoints and disorder that currently occur on a regular basis. Funded by the UK FCO, the project will build upon previous work carried out by UNHCR and the Norwegian Refugee Council, in consultation with British Embassy Amman, this project aims to build the capacity of the 500 Gendarmes who currently police the 100,000 strong refugee camp in Zatari. As well as providing training in public disorder and human rights, the programme will deliver support in community engagement and liaison. 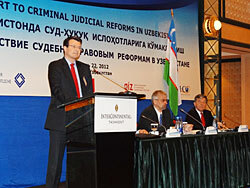 NI-CO worked with several EU partners to build long term capacity at strategic level within the Uzbekistan Supreme Court Research Centre, the General Prosecutor’s Office, the Ministry of Justice and the Ministry of Interior regarding the implementation of new decrees on the rule of law and the death penalty.